Without crude oil on an upswing, inflation can only be on the downswing. That may seem like a tautology of sorts, but it’s not. In fact, those advocating for the optimistic economic case have been predicting consumer prices being directed by something other than oil. I know it’s a broken record, but here it is again: labor shortage, competition for workers, wages explode, and companies across-the-board raise their prices to offset the increased costs. The key to that last part, if it was to ever arise, is that companies are able to raise their prices because the economy is actually booming. The theory about wage-driven inflation is really where inflation is confirmation of the economic processes everyone wants to see. Instead, consumer prices are being set by WTI alone. There is nothing else, more so what is going on in everything else continues to suggest undershoot – no economic strength. 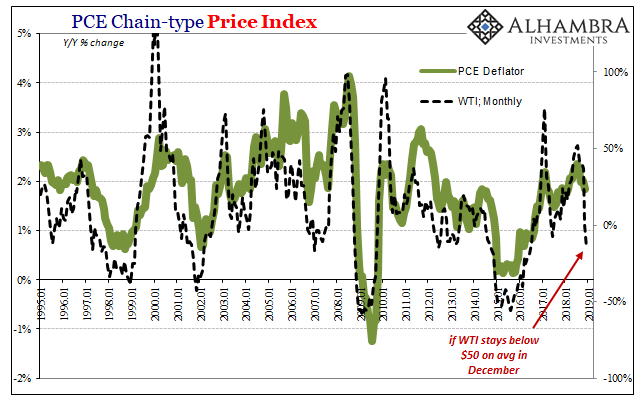 Take away the base effect of oil, like during last month, and the PCE Deflator suddenly loses its position near enough to the 2% target. In November 2018, according to estimates released today, the Bureau of Economic Analysis (BEA) says consumer inflation ran at a 1.84% annual rate. It was the lowest since January because WTI was pretty much flat. With the oil crash gaining speed throughout December, Jay Powell is going to need a massive rally into year-end in order for the Fed’s preferred inflation gauge to avoid being pulled further away from its policy mandate. His entire case derived from the unemployment rate rests upon the PCE Deflator. 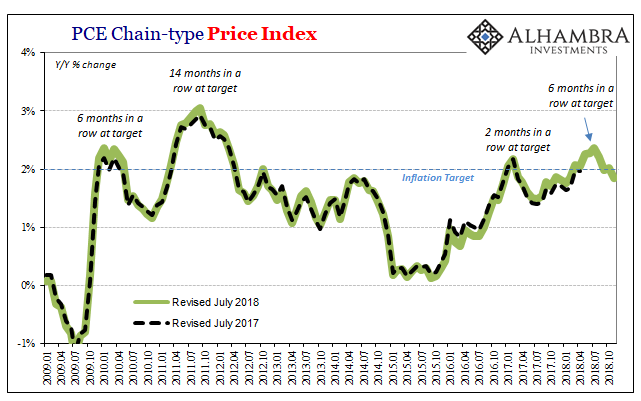 And while it was above target for six months in a row, and seven out of eight (with a slight upward revision to October), though that was only oil it was enough for the mainstream to suggest there was some inflation consistent with the theory. It at least looked the part. If the deflator sinks again, as it likely will, the FOMC loses its last piece of sketchy evidence. Markets, obviously, have already given up what little was in policymakers’ favor. The reason that we keep hearing about the "strong" economy is from the first term propaganda class: Repeat a lie often enough and people will start to believe that it is the truth." Likewise, consider all of those CEOs who constantly spout sunshine. If they told the truth they would be out on the street by noon the same day. There is a lot of weakness in the economy. Everybody worries about a potentially tight labor market just around the corner. It may come, but we could have a recession instead.